When Michael was a boy his father Bob Dimin would take him to Gosman's Dock in Montauk, NY to fish for Striped Bass. A fifty-four pounder from one great fishing day remains mounted on a wall in Bob and Doris Dimin's Point Lookout, NY home. By the time Sean began fishing with Grandpa Bob, the stripers were gone. While striped bass populations made a significant recovery due to better management in the past decade, we are concerned about current trends, and worry that Sean's sons Charlie and Jack might not learn to appreciate the magnificent striper. Long before they began connecting fishermen with chefs at Sea to Table, the Dimin family had developed a reverence for Striped Bass. Tying up to inlet bridges at the change of tide, drifting live crabs or clams, nothing was more thrilling than a striper hitting the hook. And nothing was more delicious than dinner that night. So loved, this April Congressman Tom MacArthur (R-NJ) introduced the Striped Bass American Heritage Act, which would designate this iconic species as the United States' "National Fish." What we have heard on the water the last few years is now being reflected in scientific reports. There is a wide concern in the decline of large breeding females, the driver of the overall population of Striped Bass, measured as the Spawning Stock Biomass (SSB); now estimated at 128 million fish just shy of the 127 million fish "unsustainable" threshold and well short of the target level. On a positive note the younger, smaller classes of Striped Bass are on a strong incline but are still a few years away from making an impact on the SSB. One issue that we think important is that some state's individual management target only larger fish off the waters of New England, with minimum size limits of 34". The result, at present, is that more adult spawning females are being harvested, troubling for the future stability of the species. Another problem is the massive harvest of menhaden in the Chesapeake, the breeding ground for Striped Bass, known locally as rockfish. Menhaden is a forage fish called The Most Important Fish in the Sea, and is the base of the food chain supporting multiple species on the east coast. One company, Omega Protein, last year harvested 158 million metric tons of menhaden for fish oil and fish meal, and the Virginia legislature increased this year's quota by 10%. Very concerning. Sea to Table has made the decision not to distribute Striped Bass from our partner docks throughout the Northeast and Mid-Atlantic regions during the summer and fall 2015 season. We believe strongly in the health and sustainable management of our domestic fisheries. The trending of Striped Bass populations is proving worrisome or inconsistent at best, and we want to be proactive in our approach to the future of this fishery. Striped Bass is a very well regulated fishery with fishermen closely monitored to the rules in place. Federal managers have enacted a 25 percent reduction in quota for 2015; even so, all of these factors combined have led us to the conclusion that it is in our mutual best interest to take a one year break from Striped Bass. We will revisit and review when new research is presented and the 2016 season rolls around. In its place we highly recommend Golden Tilefish as a fantastic and versatile substitute. 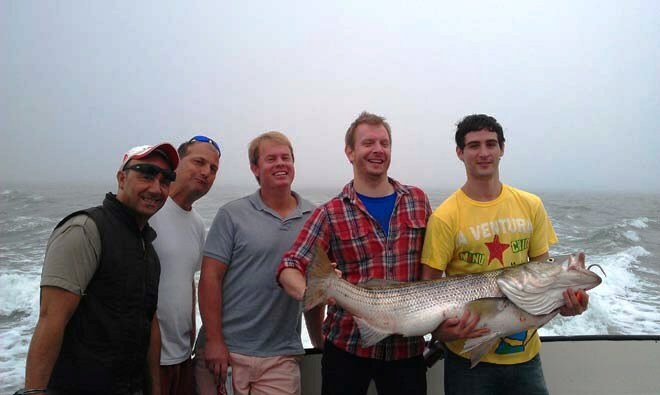 Chef Russ Johnson of Oklahoma City's Ludivine with a Golden Tilefish landed in Montauk, NY.